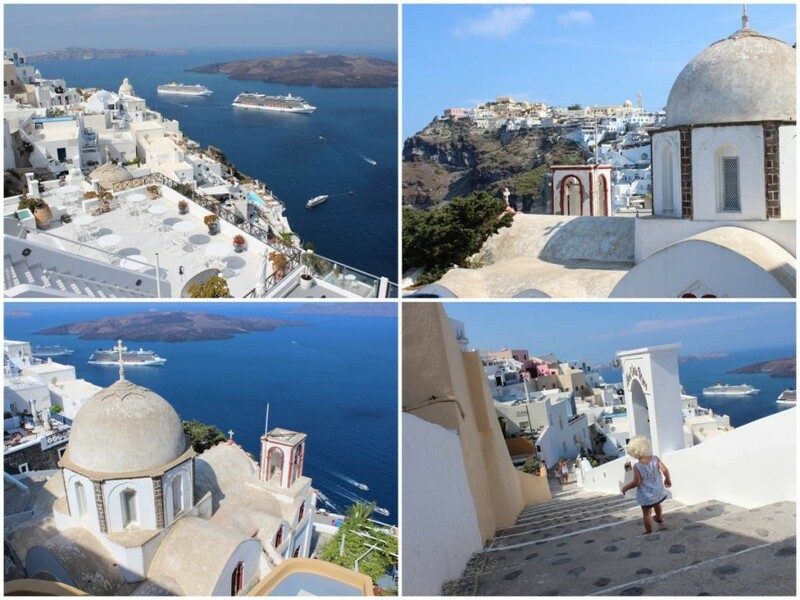 Santorini in the dreamy southern Cyclades is one of the most famous destinations in the Greek islands. Near paradise with picture-perfect towns perching on the edge of the extinct volcano, winding marble streets and glorious sunsets. The most dramatic island of the Cyclades took its shape, when in around 1200 BC, a massive volcano eruption blasted out the centre of the island leaving a steep-walled, sea filled crater in the middle. Now, white-washed villages and villas line the lip of the sea-crater, looking down on a sparkling blue sea hundreds of feet below. It's no wonder that the island is ranked as one of the most romantic destinations in the world and on the top of many honeymooners' wish list. Santorini's star Oia, is the ultimate Greek Island village - all white houses and blue domed churches tumbling over the lip of the caldera. The town must be one of the most magnificent settings on Earth, with its converted traditional houses on the very edge of the crater and spectacular sunsets that draw coach parties from across the island. 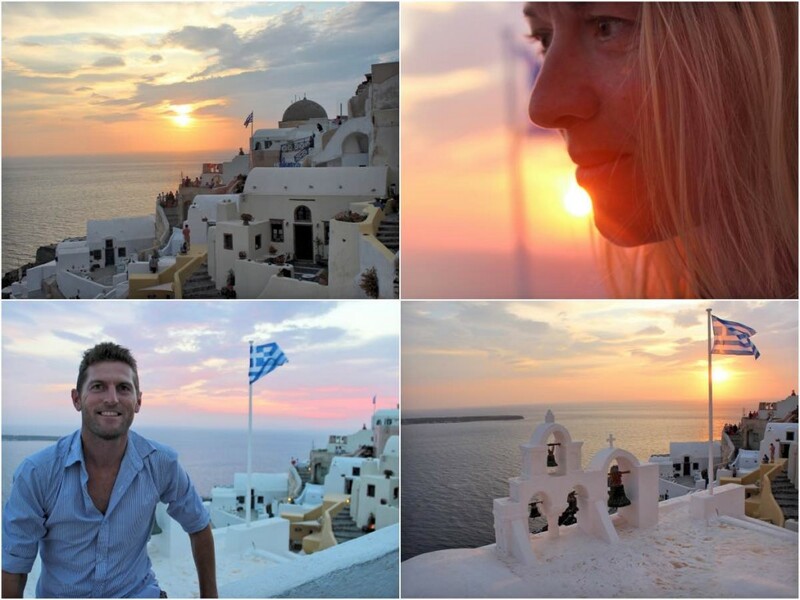 Carved out of the cliffs on the northwest edge of the island, Oia is perhaps the most photographed village in Greece. Take your time poking around town. Wander through the winding alleys; explore the cave houses, small cafes, restaurants and shops and take in the stunning views of the caldera. Every corner is postcard perfect and a happy snappers dream - head there early to beat the tour buses. Don't miss taking a walk down to Ammoudi, a tiny harbour at the bottom of a cliff for a swim, meal or boat trip. The entire area of Oia is amazingly beautiful morning, noon and night. Santorini sunsets are famous for being some of the best in the world and the village of Oia is the most famous place on Santorini to see the sun set. Here you can watch the sun dip down below the horizon as the sky turns all sorts of orange and yellow and pink behind the oh-so Greek blue domed churches, whitewashed buildings, and infamous windmill. Watch from a cafe, a boat or jostle for position amongst the crowds at Sunset Point - it really doesn't matter where you see it - you'll be spellbound. Poise your camera for the infamous sunset shot - it's one of the world's all time classic views. Fira definitely feels the tourist hub of the island, but that doesn’t mean it’s devoid of charm. If you get off the main drag of tourist shops and ice cream stores, it still retains some of that classic Cycladic feel. You can lose yourself meandering amongst its white marble lanes - jammed with designer stores and cool bars, restaurants and nightclubs. Don't miss the breathtaking cable-car ride down to the old port. The cable car soars off the edge of the volcano and floats down 300 metres, past extraordinary solidified lava flows and rock formations. It is one of the wildest white-knuckle rides in Europe. Akrotiri is a roughly 3,500 year old Minoan town preserved in volcanic ash (like Pompeii) on the southern part of the island. The excavation site is covered by a roof making it comfortable to visit no matter what the weather. The ruins, are extremely well preserved. Streets, buildings, stairs and even second floors of buildings are still visible. You can stand right amongst the ruins and look at Minoan pottery and frescoes. Destroyed in the huge earthquake and then buried under a preserving layer of ash and rubble, the town is still being excavated now. It’s a fascinating site - check opening hours as it often closes by 3pm. Don’t expect soft white sand and turquoise waters in Santorini, this is a volcanic island after all. Instead you’ll find black sand with dramatic cliffs rising behind them and the deep blue waters of the Aegean Sea. Perissa is one of Santorini best beaches. A long dark sand endless beach, 7 kilometres of sweeping shore backed with traditional taverna's cafes and bars. You're sure to find a spot to kick back on a lounger and enjoy some local Greek cuisine. It's also well protected by cliffs from the summer Aegean winds so the waters stay calm even on the blusteriest of days. Watch out though the sand gets red-hot (or rather black-hot) keep your flip-flops to hand at all times! The red beach is arguably one of the most famous and beautiful beaches of Santorini. It is located only some steps away from the ancient site of Akrotiri. It is blessed with unique coloured sands, a beautiful sandy shore, clear blue waters and large volcanic rocks. The soaring red lava cliffs which drop right to beach make for a majestic and impressive setting. The beach can be reached either by boat (there are several connecting Red Beach with Perissa and Akrotiri or by foot (10 minutes walk from Akrotiri, you have to reach Agios Nikolaos church in Akrotiri next to the excavations area). These are some of the best apartments we have stayed in on our trip so far; spacious, bright, comfortable and beautifully decorated. The room itself was a studio with our own private balcony overlooking the mountains. The room was well equipped with a single and double bed, sofa and the kitchen had all we needed - kettle, fridge, hob and pots and pans. On arrival at the jetty we were greeted by the lovely Margarita who gave us such a warm welcome. She is very informative and always happy to help you with island information, places to eat and she also offers car hire, day trips etc. 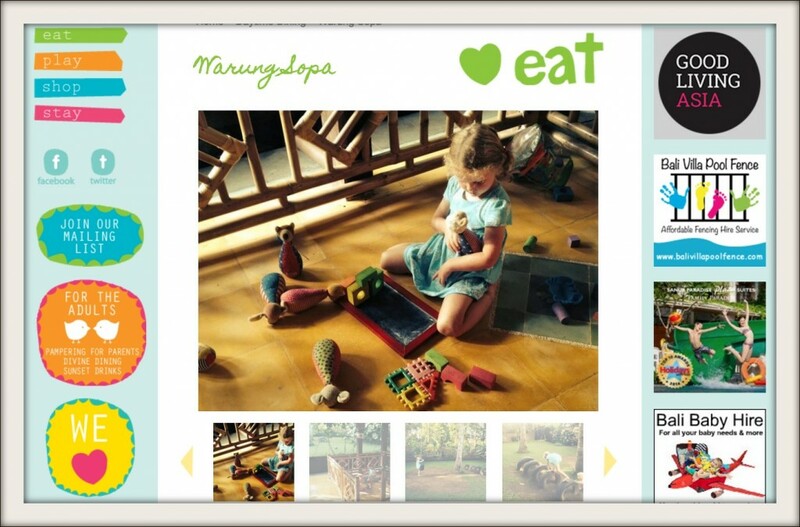 They provided us with a high-chair, baby cot and even a buggy to use during our stay - totally over and above! The accommodation is at the top of the resort but we didn't mind the walk into the centre of the resort and beach - 10-15 minutes. Handily for self-catering there are two big supermarkets and a 24 hour bakery within 5 minutes of the apartments. There is a lovely large pool surrounded by day beds, loungers and plenty of shade. A smaller splash pool perfect for the kids. We cannot recommend this gem of a place enough and would stay back there in a heartbeat if we were ever in Santorini again. Santorini is one of the most popular of the Greek islands making it easy to access by air or sea. You can hop on one of the many ferries or planes from Athens or it is well connected to many of the other Greek islands. We hopped over from Heraklion in Crete on a large comfortable ferry - the two hour journey was super easy. Just make sure you book tickets well in advance as it can get busy in peak season. If travelling with kids it's also worth shopping around as the child-policy seems to vary a lot between providers. We managed to get the girls on for free with Hellenic. Once on the island there is a frequent and reliable bus service or you can hire a car to explore at your own pace. 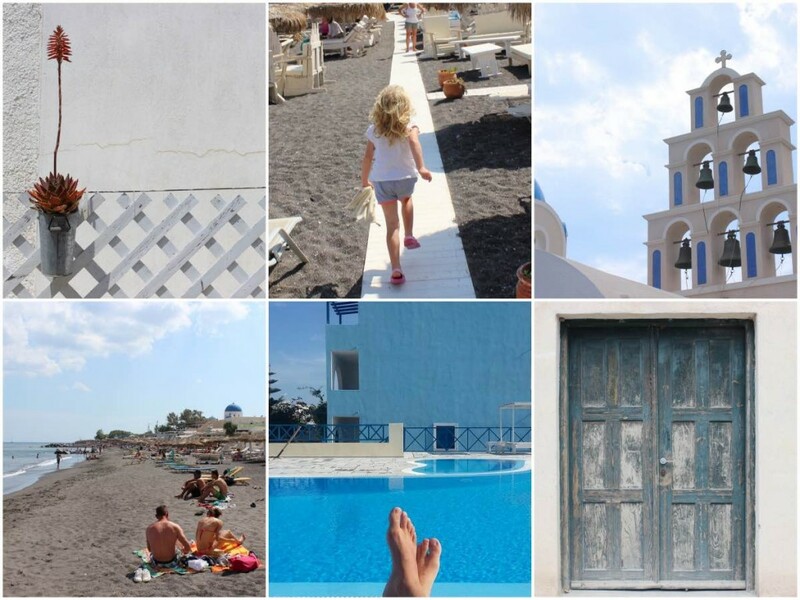 Santorini is blesses with 300 days of sunshine a year. The height of the season is July and August, but things are already hotting up in early summer when you'll also get to enjoy it without the crowds. The Spring season (March/April/May), when the island is really green, is ideal for hikes and island discoveries. 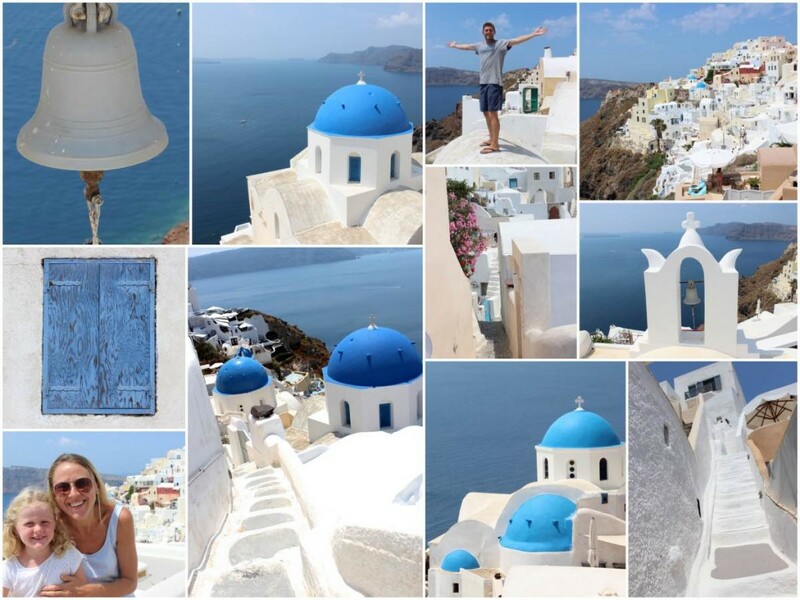 For enjoying the best Santorini has to offer without the crowds the best month is June. With the most picturesque villages, the blackest beaches and the most impressive sunsets Santorini really is sensational!